The North Fork Ranch Guide Service is the official outfitter of the exclusive Orvis Endorsed Fly Fishing Lodge, The North Fork Ranch. Located just 50 minutes from Denver, Colorado, we are a full service fly fishing outfitter. The North Fork Ranch Guide Service is the official outfitter of the exclusive Orvis Endorsed Fly Fishing Lodge, The North Fork Ranch. In addition to the private water fly fishing at the North Fork Ranch we also have access to other private ranches providing us the opportunity to host you on a variety of private waters for your personal fly fishing adventure or to host your larger group fly fishing events. The South Platte River and it’s tributaries surround us at the North Fork Ranch. Our guides are hungry to share their wealth of knowledge on the public waters we fish. Through special use permits we offer guided fly fishing trips on the classic sections of the South Platte River. Colorado private water fly fishing at it’s best. The legend continues to grow with every trophy rainbow trout caught at the ranch. This carefully managed private water fly fishing ranch is situated in a secluded tranquil valley along the North Fork of the South Platte River. The exclusive property offers the best private water fly fishing in Colorado without paying a membership. This section of river is loaded with huge rainbow trout. Large rainbows from 2-5 pounds are common. Many monster rainbow trout up to 10 pounds have been caught here. Also home to brown trout, cutthroat trout, and brook trout, the ranch provides a unique trout fishing trip for anglers of all skill levels. North Fork Ranch is open year around. Another premier Denver fly fishing guide trip opportunity for anglers of all abilities.Boxwood Gulch Ranch is owned and managed by Dan Mauritz. It is one of the longest standing Colorado private water fly fishing destinations. Like the North Fork Ranch, Boxwood is also know for trophy trout and unique hospitality. Boxwood boasts a comfortable clubhouse for anglers that includes restrooms, couches and a beautiful flagstone patio. Also home to monster rainbows, there is a better chance of catching a trophy brown trout here. The trout species diversity is unique including rainbow trout, brown trout, cutthroat trout, brook trout and even the elusive Palomino trout. This private water trout fishery includes over two miles of fly fishing water on the North Fork of the South Platte River. It is located in the meadows just upstream from Boxwood Gulch and is managed by the owner of Boxwood Gulch Ranch, Dan Mauritz. This section of river is also home to a variety of large trout. Structured with a greater variety of water, we tend to fish more water when fishing at Long Meadow. It is home to longer pools and riffles as well as sections of pocket water. There is a small braid from the main river that can fish just like a small creek. Long Meadow Ranch is a great location for dry fly fishing in the season. Also a fun opportunity to fish a dry dropper rig. Before it became associated with the popular adult cartoon, South Park referred to the greater basin of the upper South Platte River in Park County Colorado. There are numerous working cattle ranches along the creeks and rivers in South Park that have managed access for fly fishing only. These are smaller creeks and rivers and are home to classic fly fishing opportunities. Fish the headwaters of the South Platte River without the crowds. The South Platte River and it’s tributaries surrounds us at the North Fork Ranch. Our guides are hungry to share their wealth of knowledge of the public waters we have permits to guide. 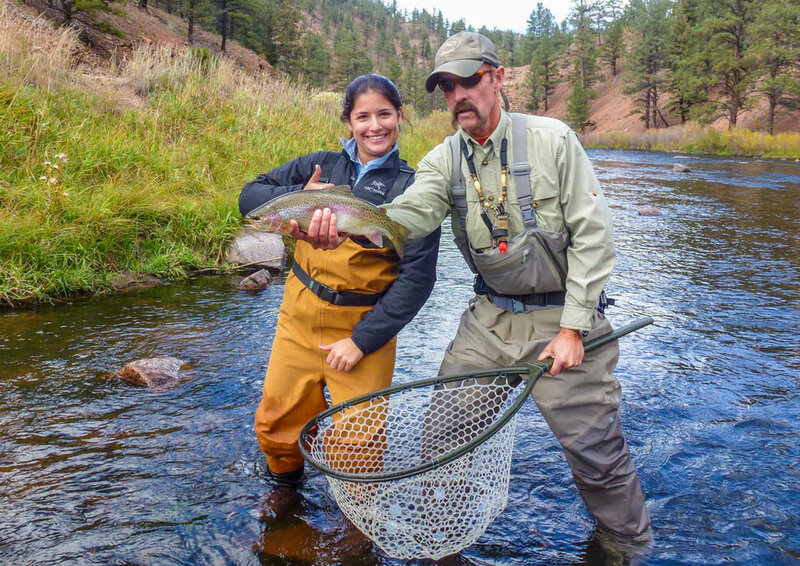 The North Fork Ranch Guide service offers the best opportunity for a fly fishing class near Denver. Our Fly Fishing Clinic is taught by Orvis endorsed fly fishing guide instructors with year of experience as fly fishing guides as well as fly fishing class instructors. Designed as your first introduction to fly fishing. A fly fishing clinic has a similar format to an Orvis 101 fly fishing class. It is designed to give you an understanding of everything you will need to know about fly fishing. An introduction. We begin with a classroom introduction to everything from trout to entomology, reading water to learning knots. You will then convene on the lawn to learn how to cast. Followed by learning how to rig a fly rod. Finishing the clinic on the North Fork Ranch pond where you get to fish and practice various techniques. © 2018 COPYRIGHT North Fork Ranch Guide Service, All Rights Reserved.